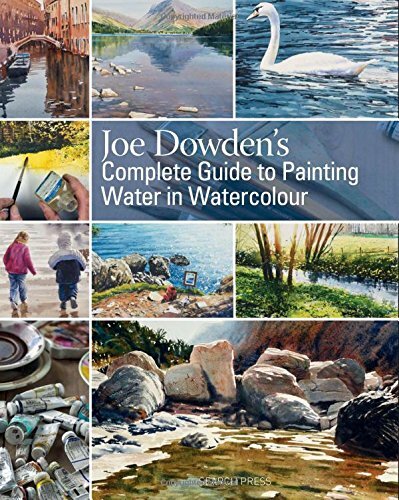 Joe Dowden's Complete Guide to Painting Water in Watercolour is a whole book dedicated to painting water. If you want to learn how to paint the different water effects, this is the book to get. There's quite a good variety of tutorials included because you'll learn things like painting ponds, lakes, rivers, wet surfaces, waterfalls, beaches and the ocean. Before each tutorial, all the materials, name of the pigments, are listed. The explanation for each step is also quite detailed. And the example paintings all look really beautiful. There are also some tips on picking your materials, taking photos for reference, understanding composition, colour theory and other little bits on art fundamentals when it comes to painting watercolours. One thing to note is Dowden uses masking fluid, so you'll need that as well to paint in a less frustrating manner. Overall, it's an excellent book when it comes to painting water with watercolours. Highly recommended.